Normally, it takes quite a bit of time before a startup gets any sort of mainstream spotlight. That’s not the case with Blippy. Tonight, the controversial social credit card data aggregator was featured on Comedy Central’s Colbert Report. As you might imagine, host Stephen Colbert ripped into the service’s ability to show everyday purchases at places such as Wendy’s. Humor aside, this appearance is a huge win for Blippy, which recently raised its first round of funding, and is now signing deals with retailers. Will Colbert Nation embrace Blippy? Sadly, YouTube is apparently smart enough to know that the Colbert Report is something they shouldn’t allow you to embed, so I’ll have to link to it — here. Update: And YouTube has now completely removed the video. Wow, they’re good. 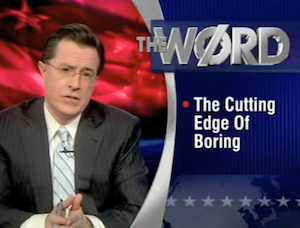 Update 2: The video’s now up on Colbert Nation. Or watch it below.